Sarah Iremonger is a multidisciplinary visual artist, based in Co. Cork, Ireland. Using found, created and adapted images and objects, as well as painting, drawing, photography, digital media, neon and video, to investigate ideas about how we understand and navigate ideas of 'Being'. Associations and contexts are mixed up to explore philisophical theories around technology, art, history and nature. Sydney Olympic Park is known internationally as a first class venue for elite sport. Known as the site of the first ‘green’ Olympics, it was cleaned of residual pollution, its natural environments restored and protected, it is powered in part by solar energy. But Sydney Olympic Park is much more than that. The site is enormous, 100 hectares, and encompasses a complexity of inter-facing environmental, cultural and social histories that the administrators, Sydney Olympic Park Authority (SOPA), have carefully preserved and enhanced. For example the pristine wetlands and woodlands along the Parramatta River on the northern border of Sydney Olympic Park are a precious remnant of ecosystems that were once common throughout the Sydney Basin. They are now preserved in the Newington Nature Reserve. Public access is highly restricted under the jurisdiction of the National Parks and Wildlife Service, and patrolled by trained park rangers. This “comprehensive protection” of nature is echoed in the barbed wire enclosure of the nearby Silverwater Jail. Why is it that the ecology of the area has been protected from development? Prior to the 2000 Olympic Games the site was an armory for the Australian Defense Force. The high security required to safe guard such a dangerous site also saved the surrounding flora and fauna in woodlands and wetlands. The armory, first established in 1882, is quite surreal. It contains a very British looking collection of heritage architecture, purpose built and extended at the beginning of the 2nd World War to store and protect the Allied Forces munitions and ordnance. The buildings are surrounded by vast, empty expanses of mowed lawn designed to isolate one repository of explosives from another. The roofs peep over high embankments designed to contain and direct upwards the blast should accidental ignition of explosives occur. One of these buildings is now the Armory Gallery, the venue for the Buffer Zone exhibition. The Armory Gallery is the largest single room gallery in Australia. Surrounded by its high earthen rampart, the red brick venue is accessed through a reinforced concrete tunnel equipped with a railway line that was used in the past to transport explosives in and out, but now a safe and silent remnant of Australia’s military history. Curious visitors, often strangers to the language of art, ride their bikes, skate boards or stroll along holding hands with their children, drawn along the railway line to see the gallery’s exhibitions – an amusement during their weekend relaxation. On weekends the park near the Armory Gallery is very busy with families and friends enjoying this unusual environment – cycling, strolling, skate boarding, riding segways, drinking coffee in the café over looking the Parramatta River. Why is nobody fishing? Alas, the river’s sediment is contaminated with industrial pollution created in the past by the company, Union Carbide, in the process of manufacturing chemicals such as Agent Orange - dioxin, the phthalates, lead, polycyclic aromatic hydrocarbons, DDT and heavy metals. Fishing is banned. For over 20,000 years the Wann-gal people had fished and foraged along the river. Shellfish middens composed of huge piles of mollusk shells accumulated over millennia by indigenous communities were evidence of the river’s bounty. The early English settlers quarried the middens for lime, which was perhaps the first destruction, at first European contact, of the Aborigine’s material culture. The Wann-gal land was soon divided up and granted to settlers for agriculture and industries such as salt mining. It is against this history, and the idea that the environs of Sydney Olympic Park is a buffer zone protecting from future change precious ecosystems and the layered traces of human impact, that the Buffer Zone exhibition was conceived by Allan Giddy, Director of the Environmental Research Initiative for Art (ERIA) at the College of Fine Arts (COFA), University of New South Wales (UNSW). Sydney Olympic Park Authority, in partnership with ERIA, supported the exhibition as part of its strong cultural program, which began in 2000 with the installation of public sculpture around the Olympic Park precinct. The curators, Allan Giddy and Ihor Holubizky, (Senior Curator , McMaster Museum of Art, Hamilton, Canada), selected Australian and international artists whose work engages with themes suggested by the venue’s rich context. The first installation encountered by viewers has a military theme. Mark Brown’s Barricade Radio recalls 2nd World War tank traps, now obsolete, as indicated by the sculpture’s ephemeral broadcast of Sydney airport’s control tower and pilots flying overhead. All electronic devises used in the exhibition’s outdoor works were powered by solar panels, an important aspect of ERIA’s research to create sustainable, robust infrastructure for electronic public sculptures that could also be used in remote communities and for light industry. My installation, Reverb, was encountered next where the visitors walk through the tunnel to the gallery. The recorded sounds of frogs and birds in the nature reserve adjacent to the venue reverberated in the tunnel, displaced from the wetland just as the wetland is displaced from Sydney Harbour’s original riparian environments. Ghostly white sticks across the rampart, like an aura, mark the passage of the tunnel through the rampart, their wavering lines suggesting sound waves emanating from inside the tunnel. Mr Snow’s kinetic sculpture, Quadrant, was installed on the railway line on the other side of the tunnel. It electronically tracks the movement of the sun overhead using weights and a solar powered motor to orientate the sculpture’s angle. The elegant, machine-like contraption rocks forward over time on the railway line. It reminds us of the sun’s power, the passage of time, transition. Its quietude contrasted with Atanas Donov’s and Allan Giddy’s collaborative installation in a small tin shed at the end of the tracks. The sounds of their personal childhood memories, of Bulgaria and New Zealand respectively, were exchanged, screened and broadcast through the windows of the shed, and into the gallery. A Soviet male choir’s military propaganda songs of occupation contrasted sharply with the inane tinkling in New Zealand of a Mr Whippy ice cream van’s signature tune, Green Sleeves. The first work encountered inside the gallery is Richard Goodwin’s Dioxin Blues. Protected by an astronaut’s suit and helmet, Goodwin as his persona Mystic Alien wades through the swamp, testing and measuring his external environment. In contrast, Pia Mannikko from Finland metaphorically explores our ‘footprint’ using the impact of her body on earth. Her installation, Still live, was made in the gallery by pressing down the weight of the body into wet clay, a poetic imprint resonant of a soft, undulating but denuded landscape. A mine sweeper’s surface skin is the buffer zone between the sailors and bombs, armaments and weather, crew and the sea, the subject of Ian Howard’s artwork titled HMAS Teal – as Scatter Pattern. Howard made rubbings of the ship’s surface in 1977, thirteen years after the mine sweeper had assisted operations against Indonesia in defense of Malaysia. Another type of buffer zone is represented in Sarah Iremonger’s video film stills, Hochsitze/Hunting Boxes. They are symbolic of the particular paradoxical relationship to nature in hunting, where a love of nature is conflated with its slaughter. The hunter sitting above nature, observing, is intent on destruction. Is Peter Woodford-Smith’s astronaut pondering the possibility that the Earth’s landscape may end up as lifeless as the moon? Our exploration of the moon is the focus of this imaginative installation, with its tiny cardboard cut-out astronaut gazing out into space below the glowing globe of the ethereal moon. Eva Barton’s series of photographs, Imaginative Landscape, transport us into fantasy worlds, whereas the videos of Lyndall Phelps and Helen Sturgess take us into the real life of birds. Phelp’s collage of landscape videos were filmed with cameras strapped onto homing pigeons in flight, reminding us of the role they played in surveillance during the Second World War. Sturgess’s seagulls dive bomb a camera, our eye, concealed inside a chip packet at Bondi beach. These birds are totally at home in the buffer zone between the human environment of the beach and the natural environment of the ocean. Our impact on nature is another strong theme in the exhibition. Annette Mangaard’s artwork HIDDEN, takes us through liminal zones where nature and urban life are juxtaposed, both ceaselessly transforming, inter relating. Postscript, John Gillies’ video installation reminds us of our epistemological footprint, showing the discarded pages of a book floating, absorbing into nature. During a residency in an armory in Scotland, Deidre Nelson made delicate cloth sculptures of local plant forms called Military Hybrids, coloring them the shades of grey of passing military ships, whereas Deborah West’s images of misty grey seascapes, Watermark, contemplate in peace the shifting natural movements of water, essential to life on Earth, fading off into infinite space. The artworks in Buffer Zone explore diverse ideas, yet together they make free associations that combine the artists’ research, imagery and processes of making. The viewer’s experience of the artworks is transitory, but memories of the encounter linger. The artists launch their ideas out into the serendipitous world of the curious stranger passing by. This is the value of public art. We encounter during a carefree excursion the unknown, the unpredicted, the contestable, the inconceivable, the true. With the participation of international artists the exhibition Raised Hides focuses on the connection of several topic-related questions. Primarily created for hunting purposes, these special architectural developments became a symbol of nature and civilization, still marking the human intervention therefore recalling environmental problems as well. Made of varying raw materials, the special – sometimes bizarre – equipments, raised hides are the proof of individual creativity and inventiveness. Society as a power structure is visualized in the work of the Irish artist Sarah Iremonger what consists of an installation and a site-specific wall painting. The Hunting Box Party refers to an imagined political party which’s members are strictly raised hides. The installation recalls the theoretical and functional meaning of these architectural realizations; besides, through representing each „party member“ on a stylish badge it creates a political connection. The photograph series of Hungarian artist Péter Pettendi Szabó explores the territory of the former iron curtain’s watchtowers from architectural, topographical and material point of view. The work deals with the changes of the past 20 years through the representation of natural and architectural spaces. Besides the artist reflects ironically onto the visually up to this day unknown territory through applying banal tourist-beloved gifts as a medium of this politically filled topic. 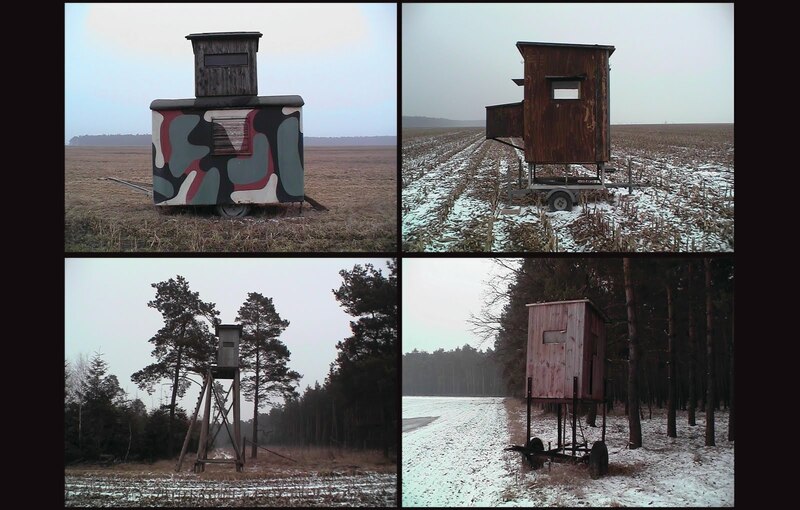 Photograph pairs are displayed of the Austrian artist Walter Ebenhofer´s raised hides series, continually developing since the 1980s, placing the look-photographs and their view-photograph pairs side by side. What can one see while being inside these raised hides and what kind of view can one have taking a quick glance from a short distance. The contrast of the untouched nature and it’s transformation through technical equipments is obvious in both cases. Nature’s values and ways of energy consumption and energy transmission are those topics which arise while looking at the works of Bertram Kober. The Leipzig based artists photograph series shows East German raised hides placed around pillars of high strained electronic wires. In his works Bertram Kober focuses on the presence and effects of these architectural developments especially from the environmental given possibilities and their appropriation point of view. The artwork of Paul Horn invites the exhibition visitors to enter and have a look from his self-made mixed-media pulpit build of wood rests and furniture parts. Thanks to the raised situation everybody can become an observant and the subject of observation, therefore part of the exhibition as well. If you have something on your mind, you are welcome to share it. With the quality to transform untouched landscape views raised hides recall topics like traditional hunting methods, the relationship of men and nature, issues of environmentalism therefore giving the exhibition a social-, political- and cultural interpretation as well. We organise a symposium on 7th of June at 7 p.m to the topic of the exhibition with the lectures of Othmar Michl hunter (Hungary-Austria), who analyse the practical functions of the raised hides, Zsuzsanna Kozák, who interprets the cultural-historical meanings of the architectural form by analysing art works. The symposium will be closed by the presentation of the project titled Lordship, realised on the exhibition No one belongs here more than you by the artist group The Corporation, focusing on the religious-spiritual functions of the architectural form (pulpit).